The e906 is a dynamic microphone with an unusual side-address form factor. It has a supercardioid pickup pattern, and a sensitivity rating (2.2 mV/Pa) slightly hotter than the Shure SM57 (1.9 mV/Pa). The side-address design makes the e906 much easier to use on its intended application, guitar cabinet, than traditional choices such as the SM57; the e906 can be draped over a cabinet and hung by its cord. The mic has a built-in EQ switch with three positions. In the “flat” position, the mic’s LF rolloff is about 120Hz. The mic’s response is flat through the mids to 2500Hz, then peaks at +5dB around 4200Hz. With the EQ switch in the “presence boost” position, the peak climbs to +7dB; in the “presence cut” position, the peak flattens to about +2dB. The high end rolls off rapidly above 10kHz. By contrast, the SM57’s presence peak happens at a higher frequency, around 6kHz. The e906 shares a basic exterior design with the e606, aka the “e609 Silver.” But these two mics produce different frequency responses, despite whatever physical and stylistic similarities they share. 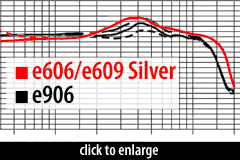 For example, the e606 has a more-pronounced presence peak, a fuller HF response, and an extended LF response (rolling off at 80Hz rather than the e906’s 150Hz). The graph suggests that the e606, especially when used for close-miking (such as laying its face against a speaker cab), would produce a much more scooped sound than the newer e906. The e906 ships with a mic clip (Sennheiser p/n MZQ 100) and a storage pouch. The Sennheiser Electronics Corporation e 906 is also known as: e-906, e906, evolution 906.